In every age, there’s always a bunch of really smart people who will stake the worth of their entire existence standing behind a belief so unshakeable, a fact so indisputable, that to challenge its veracity would be tantamount to sacrilege. Like the big brains who knew beyond the shadow of a doubt that the sun revolves around our great planet earth (and they even gave a good talking to to the lone moron who claimed otherwise). Or the bright sparks who pooh-pooh-ed that nonsense about the earth being anything but flat, flat, flat. And should there ever emerge any hint of their belief being even slightly, shall we say, misplaced… uh oh. Well, it would appear that the moneybags behind I Love You Phillip Morris had something in common with some of the great minds mentioned above. One can just imagine them sitting around in their Armani togs, dreaming up how they can add to their Victoria’s Secret diamond bra collection by producing a surefire, idiot-proof box-office winner, when one of them smacks his forehead in a ‘why-this-sure-is-a-no-brainer’ gesture . ‘We’ll just get Jim Carrey to star in it of course!’ he exclaims. And so they all nod vigorously and slap each other on the back and pass around cigars. They get two guys they’ve never heard of to write and direct, not at all pushed when the two meekly say they’d like to do a story about two gay men (‘Hey, that Brokeback Mountain won a bunch of awards!’). The film gets made and they sit back and wait for the silver dollars to start rolling in. Except, in order for that to happen, the film actually has to get released in movie theatres. You see, the part that the suits got wrong was that every Carrey vehicle is guaranteed to open and open big. Unfortunately, even that once-irrefutable fact no longer seems to hold water: Phillip Morris, released at various points over the year in parts of Europe, is still to see a Stateside release. Actually, to be fair, the movie probably didn’t have studio-type dolts behind it at all; it is an ‘indie’ film in many respects, but the bottom-line remains that it is in fact a damn shame that American distributors, or whoever it is with the severe myopia, got cold feet when it came to it being shown, for it is a strangely effecting, oddball, wonderful curiosity piece of a movie. Loosely based on a true story, it is about small time Texan cop Steven Russell (Carrey), an all-round decent fella, a good provider to his family who is a loving father to his daughter, and who makes dutiful love to his wife (Mann) every night, and oh, who also happens to be a closeted homosexual. After a near-fatal accident, he decides to chuck up his safe but fake life and go forth into the world as a proud gay man. 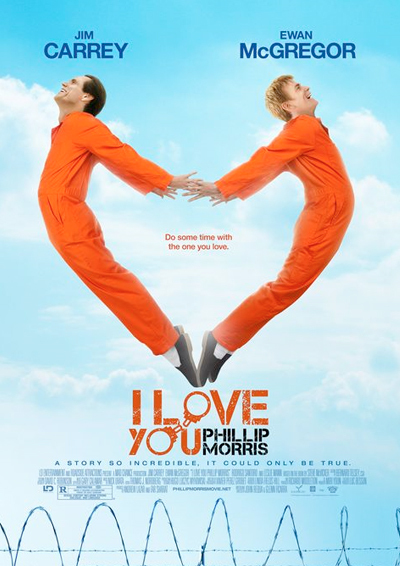 But, as he discovers, “being gay is really expensive.” So he turns con-man, gets rich, gets caught, gets thrown into prison, where he meets and falls hopelessly in love with new inmate Phillip Morris (McGregor), a shy, soft-spoken, “blonde, blue-eyed queer”, as Morris describes himself. The two become inseparable, but even when they get out (through dubious means), Steven, much to Phillip’s dismay, seems to have a compulsion to continue with his conning ways, which includes impersonating a lawyer, fraudulently snapping up a high-flying CFO position, and (the cincher) pretending to die of AIDS. The plot may be wildly improbable but much of the film’s strength lies in acknowledging that improbability and just running with it. There is a kind of gleeful disregard for cinematic, and indeed, storytelling, convention in Ficarra/Requa’s screenplay, and it translates well to the screen. The tone is irreverent but never frivolous; there are laugh-out-loud moments aplenty but also a strange melancholy at the heart of it which makes it compelling beyond your average Carrey project. Speaking of which, the actor’s performance is utterly fearless. Not since Eternal Sunshine of the Spotless Mind has Carrey tackled a role with such relish; it is an astonishingly complex part and he is dazzling in it. And McGregor provides a deft counterpoint; the chemistry between the two is brilliant to watch. So why is the movie still to see the light of day in its country of origin? Perhaps because, despite the laughs, it’s not your typical comedy. Or perhaps because it is unflinching, even joyous, in its depiction of gay relationships, reveling in the giddy exploration of guy-on-guy passion rather than alluding to it in lyrical landscape metaphors ala Brokeback Mountain. Who cares. Just sit back, enjoy the show, and chuckle at the thought that for once you get to see an American movie before the Americans do.